Or switching grounds, so to speak, trekking through the UNESCO World Heritage site of the Skocjan Caves, which features the largest underground canyon in the world and is only 30 minutes away from Koper. Or touring the Slovenian capital city of Ljubljana, truly one of Europe’s secret gems—but not for long, since Lonely Planet recently ranked Ljubljana at #2 on its Best in Europe list. 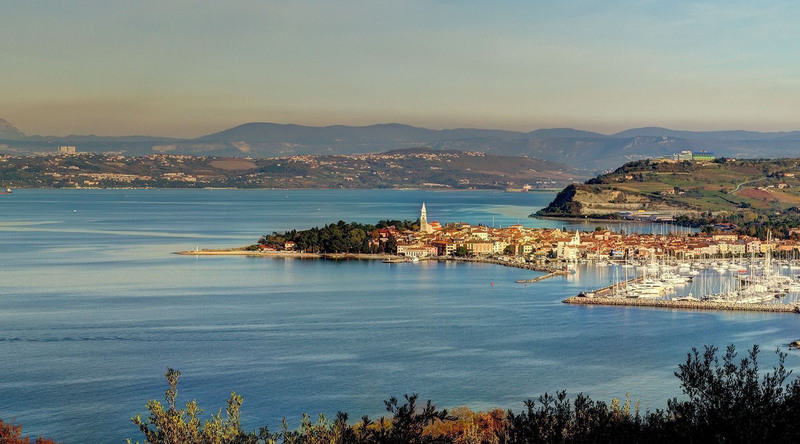 Then of course, there are the charms of Koper itself, especially in the Old Town, with historic sites like the 12th century St. Mary’s of the Assumption Cathedral, the Praetorian Palace, and the beautiful square of Titov Trg. What are you going to do?! This beautiful pedestrian square in the heart of Old Town is an ideal starting point to explore Koper. Explore the arcaded Venetian Gothia Loggia, the gleaming white 15th century Praetorian Palace, Armoury, 12th century baptistery and climb 204 steps up the belfry of the Cathedral of the Assumption for wonderful views. This UNESCO World Heritage Site features the largest underground canyon in the world, where the Reka River disappears underneath a rocky gorge. With its exceptional natural and cultural significance, the Skocjan Caves feature unique flora, fauna, and a special ecosystem, thanks to their particular microclimatic conditions. Cross the border into northern Italy and explore the Italian coffee capital, Trieste. Journey by train and on foot through the vast subterranean chambers the Postojna Cave, a jaw-dropping wonderland of stalactite and stalagmites. Spend the day learning about life in Slovenia at home of a local family who’ll invite you in to share lunch, wine and great conversation.